By now the denizens of the internet are well aware of the fact that the world wide web can be a somewhat dangerous place if you are not careful. Malware is one of the many dangers that the internet poses to the unguarded user, but there are now so many checks and balances in place that usually getting malware is something that only occurs if you were careless and did not take the right precautions in order to protect yourself from these security threats. However, one would not expect to get malware on their phone from certain places that they consider to be absolutely secure. One such place is the Google Play Store. 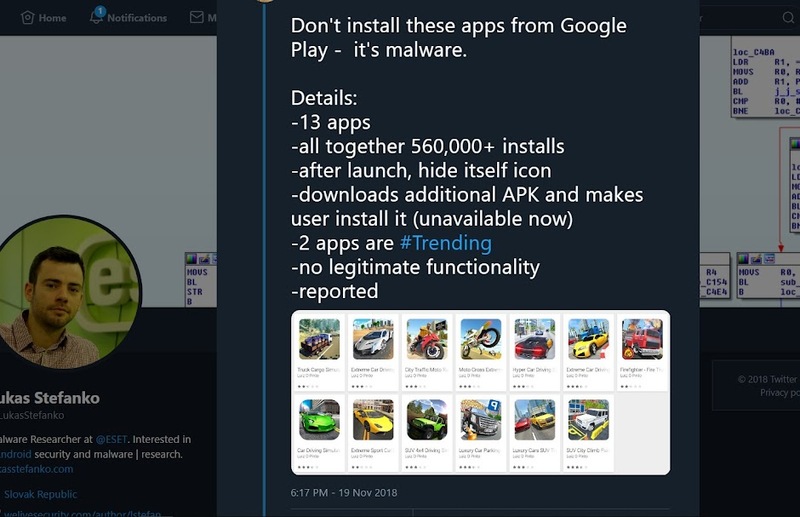 However, in spite of the measures that were taken in order to keep users safe, over half a million people ended up downloading malware from apps that were readily available on the Google Play Store, as spotted by Lukas Stefanko, an Android security researcher. These apps were ostensibly driving games. Over a dozen of these games were available on the Play Store, and some of them even started trending, thus making them visible to a far larger group of people than what would have been the case otherwise. When the apps were downloaded, they would basically not work very well. They would be buggy and would not get very far before crashing. What users did not know was that behind the scenes information was continuously being sent to an app developer in Istanbul. The developer has yet to respond to inquiries, and the exact functionality of the malware is yet to be discovered. Google has now removed the app from the store but the damage has been done. Google will need to beef up its security policies in order to avoid being unfavorably compared to their biggest competitor, Apple.